But the thing is, Moana’s a really good film. It’s a complex film, full of interesting issues – perhaps too complex for its own good – but it can stand proud amongst Disney’s impressive recent output. Chief-in-waiting Moana (Auli’i Cravalho) dreams of going out beyond the reef surrounding her island, but her father, the Chief, has expressly forbidden it. One day the Ocean’s calling proves too much for her, and she sets out alongside the Demigod Maui (Dwayne Johnson) on a quest that will change her peoples’ future. 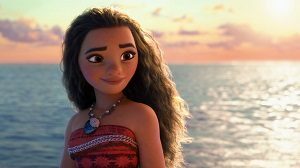 With minority representation at the forefront, not to mention a three-dimensional female lead, Moana continues Disney’s recent efforts to diversify the cinematic landscape. That’s not to say the film lacks problems (as I understand, it skirts close to appropriating Pacific islands culture, and the depiction of Maui came under criticism) and there was certainly a problem with some of the merchandising. But this is a film where more than half the characters are female, and Moana is clearly the star of the show, rather than Johnson. The film deals with the theories of Polynesian navigation, and it’s important to note that when Thor Heyerdahl suggested such a thing in the mid-20th Century, it was met with scepticism. (See Kon-Tiki for more about this.) This is coupled with the idea of Moana wanting to become a different kind of leader from her father, whilst Maui’s dealing with his own issues, having lost his magical powers. It may come as little surprise, but the animation here is jaw-dropping. Brave may have amazed us with Merida’s hair (Moana’s do is also spectacular) but here it’s the lighting that really stood out for me. After seeing bland and over-lit animation like The Secret Life of Pets, this was a godsend. It just goes to show that there’s still new ground to be broken in 3D animation. Moana won’t be the hit that Frozen was, but it’s a fantastic film. I kept thinking it should have been more focussed, but what’s wrong with an animation that has narrative depth, and perhaps even requires a rewatch to take in all it has to offer? This entry was posted in Film Reviews and tagged Action/Adventure, Animation, Childrens, Fantasy by Stuart Wilson. Bookmark the permalink. Writer: Jared Bush, Ron Clements, John Musker, Chris Williams, Don Hall , et. al.